Oddly enough, when I first read of the flap caused by Mr. Egeland's statement, my first thought was "Right on! Telling the truth..." And then Mr. Egeland was obviously forced to reconsider his remarks. Politics, perhaps? Perhaps he liked his job and wanted to keep it? Facts are facts and the fact is, as a world class government, we are the stingiest. We rank lowest among industrialized nations on the percentage of GNP given as aid. End of story! That's a fact! Get over it...it has always been this way. But American's, as private citizens, as fellow human beings, are generous and always have been. If the Administration had been smart, which they aren't, they would never have responded to Mr. Egeland's comments and would have let our actions tell the story. Now, the world can only wonder why we doth protest a bit too much. The eruption of a volcano in the Canary Islands could trigger a ''mega-tsunami'' that would devastate Atlantic coastlines with waves as high as 330 feet, scientists said on Wednesday. They said an eruption of the Cumbre Vieja volcano on La Palma, part of the Spanish island chain off West Africa, was likely to cause a massive chunk of rock to break off, crashing into the sea and kicking up huge walls of water higher than any other in recorded history. The tsunami would be capable of traveling huge distances at up to 500 miles an hour, the scientists said in a research paper to be published in September's Geophysical Research Letters. But Cumbre Vieja should be monitored closely for any signs of activity so that emergency services could plan an effective response, he said. ''Eruptions of Cumbre Vieja occur at intervals of decades to a century or so and there may be a number of eruptions before its collapse,'' said Day, who collaborated on the research with Steven Ward of the University of California. The effects would spread north, west and south of the Canaries, with the west Sahara bearing the worst of the wave's energy. The energy released by the collapse would be equal to the electricity consumption of the entire United States in half a year. Immediately after the landslide, a dome of water 900 meters (3,000 feet high) and tens of miles wide would form, only to collapse and rebound. As the landslide rubble moved deeper under water, a tsunami would develop. Within 10 minutes, the tsunami would have moved a distance of almost 155 miles. On the west Saharan shore, waves would probably reach heights of 330 feet. Florida and the Caribbean, the final north Atlantic destinations to be affected by the tsunami, would have to brace themselves for 165 foot waves some eight to nine hours after the landslide. Wave heights toward Europe would be smaller, but substantial waves would hit the coasts of Britain, Spain, Portugal and France. The research paper estimated water would penetrate several miles inland and that the devastation would cause trillions of dollars in damage. I like it! My ramblings can be beneficial…to me. But, the study doesn’t indicate what your writings will do to the health of those who read them. Could this be a whole new field of opportunity for lawyers? For government? Poets could be sued for practicing medicine without a license. As you can imagine, the possibilities are endless. I found this great quotation the other day, nestled in among a hundred other lesser quotes and I have come to enjoy it. “The believer is happy; the doubter is wise. - Hungarian proverb” This is true! Although I am not Hungarian, I can always appreciate a brilliant thought. And of course it validates my role as critic, cynic and curmudgeon. Can you imagine just how much money stands to be made by those who are friends of this administration? Those that just might be the lucky recipient of this government largesse…kind of reminds me of Halliburton and friends. “The first salvo was launched by the Securities Industry Association, which recently issued a research report arguing (Arguing means that there is another opinion) that the private accounts would not be a financial bonanza for Wall Street. In the paper, the association calculated that firms would collect at least $39 billion in fees, and perhaps considerably more, (What does “Perhaps” mean?) from managing such accounts over the next 75 years. But the group noted that the fees charged would be significantly below the fees that investment firms receive these days from low-cost mutual funds. And even if the fees rose significantly as more people chose actively managed accounts, the association's report argued, they would still pale in comparison with the $3.3 trillion in revenues Wall Street firms are projected to earn from their core securities business over that period.” -But we’re not comparing them; we’re talking about adding to them! Doesn’t anybody remember the story of the fox and the henhouse? It looks like AOL is on a fresh campaign to litter the landscape with shiny new CD's. I have received about half a dozen of them in the past few weeks. And now I see that they have resorted to using pop-ups that suddenly float free of the page where they appeared to be images only. I guess that they can sneak past pop-up detection software that way. What's with them? Why would they want to irritate the public anymore than they already do? I also wonder if there is a AOL support group that enables those who are addicted to AOL to break free? Hello, my name is Steve and I used to use AOL. (1992) But now I'm free! I like a lot of what he says here...As a Christian, it is up to me to decide to be offended by the secularists. I can also choose not to be. My personal thoughts on this are...Leave this holiday to the secular world. It has always belonged to them. Let us celebrate the birth of Christ every day, as we should. Yes, this is an old joke...I ran across it the other day and decided to post it just for fun. New Element Discovered in Washington, D.C.
A major research institution has recently announced the discovery of the heaviest chemical element yet known to science. The new element has been tentatively named "Governmentium." Governmentium has 1 neutron, 12 assistant neutrons, 75 deputy neutrons, and 11 assistant deputy neutrons, giving it an atomic mass of 312. These 312 particles are held together by forces called morons. These, in turn, are surrounded by vast quantities of lepton-like particles called peons. Since governmentium has no electrons, it is inert. However, it can be detected as it impedes every reaction with which it comes into contact. A minute amount of governmentium causes one reaction to take over 4 days to complete when it would normally take less than a minute. Governmentium has a normal half-life of 3 years; it does not decay, but instead undergoes a reorganization in which a portion of the assistant neutrons and deputy neutrons exchange places. In fact, governmentium's mass will actually increase over time, since each reorganization will cause some morons to become neutrons, forming isodopes. This characteristic of moron-promotion leads some scientists to speculate that governmentium is formed whenever morons reach a certain quantity in concentration. 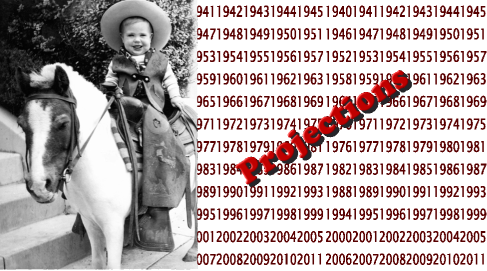 This hypothetical quantity is referred to as "Critical Morass". I’m enjoying the morning, sipping on my coffee and exploring the news, as usual. What a great way to begin the day! What did I do 30 years ago? I would have been 34 years old and the year would have been 1974. We lived in Newbury Park or Brea. I can’t remember when we moved to Brea, but it was close to that time. I was a superintendent at the time and would have been up very early, just as I am now. But I had no computer and I would have listened to the radio for the news of the world, early in the morning. Yes, I like this better. I grew up during those early times and I must say that I like the information loaded world of today far more than that of the 1940’s. Truth is far more important than some sort of perceived unity. Another case of "blind justice"
I know this is silly...but if I took the time to write in a candidates name, I would assume that anyone else, with a modicum of common sense would understand that I wasn't just practicing my penmanship and that I really did want to vote for that person. Ah, but I am talking about common sense, and that is sadly lacking in the judiciary. 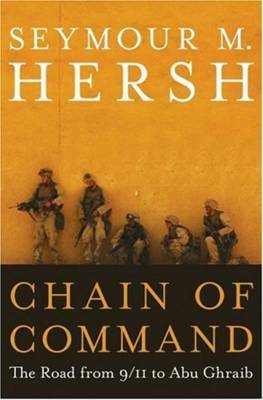 Here is another opinion of the Seymour Hersh book. I'm only about 40 pages into it, but I find it fascinating. If you have broadband and are able to view Flash animations, you might enjoy this website...I don't know anything about the movie, but the previews look like fun! But I've been wrong before. Yes, there are sounds as well, so keep an eye on the volume. Here's everything you didn't want to know about Iraq. The FAA's concern stems from whether airborne cell phone calls could interfere with a plane's navigation and electrical systems, agency spokeswoman Laura Brown said. The technology used on seatback phones causes no such interference. Amazing photo of real people without "real lives". Should be called "childish language" ... Real adults have more common sense. Or should. Well, I found it, home at last! Absolutely amazing! First, Dino Rossi wins by 261 votes. A mandatory recount of machine voting occurs. Now the margin is only 42 votes...what happened to 219 votes? And the Republicans began to squeal when Democrats demanded and paid for a hand recount. Doesn't the fact that 219 votes simply disappeared, bother the right wing? It seems to me that no matter what your political views are, you would want to get to the bottom of this mystery. All taxpayers/voters in the state should be appalled that voting can't be 100% perfect! And now to top it off...561 votes that were not counted. How many others are sitting in county vaults? A odd little bit of news...when the USA audited the recent election in Venezuela...(We didn't like the results) the Venezuelans used electronic voting machines that provided a paper trail. Yet we seem to have a problem providing machines like that for ourselves? Maybe we should buy our voting machines from Venezuela. Yesterday, I had to laugh when I read the inscription on a refrigerator magnet that my oldest daughter pointed out to me. She had placed the magnet in a prominent spot and it read, “Hippies use the side entrance”. Both my oldest and the youngest child are slightly? 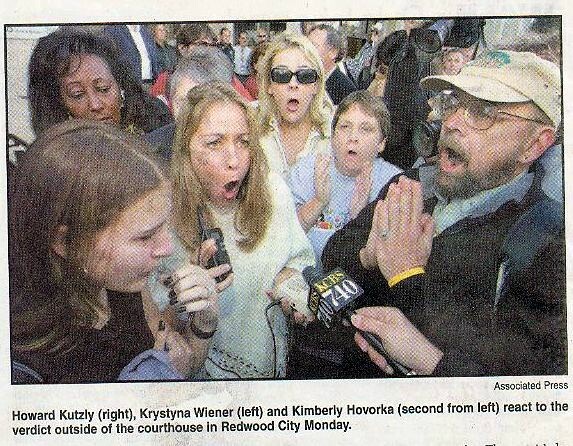 upset with their father and his latest incarnation as a “hippie”. My middle child seems to think it’s OK. My grandchildren also think I’m OK. What none of them realize is that I have always been this person, this “hippie”. So what is a hippie? An on-line dictionary states this…“Unconventional young person of the 1960’s. A young person, especially in the 1960s, who rejected accepted social and political values and proclaimed a belief in universal peace and love.” I guess that is almost right. Only the date is wrong. I started my quest for hippiedom in the late 1950’s. That is when I, along with my friend, Mike, decided to buy a 1949 Divco bread truck. We were going to convert the bread truck to a mobile home of sorts and go to New Orleans to live. My plan was to become an artist and live off of the income from odd jobs. Mike’s plan was to become a jazz musician. He was already a very good clarinetist. We gutted the interior of the bread truck and painted it a lovely shade of orange. Then we found some green shag carpeting for the floor and a friend’s parent’s donated a living room set, a couch, two chairs and a small table. Does that sound “unconventional” to you? Then reality set in when my father gave a firm “NO” to the plan. I was very disappointed and now, looking back on that time, I sometimes wish I had defied my father and made the trip to New Orleans. I really do love the life that God has made for me since that time, but I’m still curious as to what might have happened if we had snuck away early one morning and headed east as we had planned. During this same time, (the 1950’s) my friends and I were becoming involved in the coffee house scene. And the best of the coffee houses was Positano’s, in Malibu. Jack Kerouac was the only author to read and stories of the “beat generation” were featured in all of the national magazines. Recently, I found this story about Malibu life in the 1950’s. Positano's was a coffee house located up a steep dirt driveway off the Coast Hwy. just north of Topanga canyon. I lived there for a short time with a guy named Tony. Tony was a Hollywood type who drove a black '49 Cadillac and called it the "Bat Mobile" because of the futuristic tailfins. I drove a black '46 Ford woody station wagon which Tony dubbed the "Bum Mobile". We rented a building on the property which resembled a small barracks. Neither of us worked in the mornings so Tony put up "blackout" shades on all the windows. When we got up it was always dark inside and we'd go blind when we opened the front door to find the sun shinning brightly at mid-day. Nothing happened at a coffee house until night fell. Because the drive up to the house was treacherous, everyone was picked up at the highway and given a ride up the hill in a Chevy "TravelAll or CarryAll" (forerunner to the SUV's). Tony and I would stand at our front door and watch people arrive until it looked like a good crowd had gathered then we'd go into the 'club' and have some coffee or tea, play chess, listen to folk tunes and eat tofu. This was the "beat" generation and most everything seemed phony to me during this era. This was pre-hippie. Synanon was operating as a drug rehab center in the old DelMar Club on the beach in Santa Monica and surfers were bums along with the rest of the younger generation. Yes, "The times they are a-changin'." My own recollections of this coffeehouse are similar. We would park at the bottom of the cliff, along Pacific Coast Highway, and wait for a Ford station wagon to come down and pick us up. You had to be a member to enter Positano’s and that would cost you five dollars. (That was a lot of money!) The house was quite old and sprawled across the top of the cliff, with a great view of the ocean if you left the house and walked to the edge. But it was inside the house that attracted everyone. There were poetry readings, singers and movies, tables to play chess and chairs to sit in and read…if that was all you wanted to do. And all of this was happening simultaneously in the many rooms that made up this house. So what happened to me between the 1950’s and the next century? Life happened and I had to conform and get along. But now I’m free to be what I always was…a darn hippie! And I will use the front door, thank you very much! Medicare and now Social Security...scary topics for the geriatric set. I don't know about you...but I can't be trusted to make a wise decision about which stock to buy or which bond to sell. That is why I had to hire a financial consultant, someone who does know. (I hope!) So why would I think that 300 million Americans can make those decisions for themselves? And when their decisions prove to be the wrong ones and they have no retirement $$$ available, who will have to bail them out? Yes, I'm getting older and this is the sort of news that makes me nervous. I still have private insurance, but when I turn 65 next year, this is what I have to look forward to. I'm already finding it difficult enough to open some jars and packages, but I can usually find something to help me pry it open. What's going to help me with a dumb answer? Here's the new 86'...go to www.nordhavn.com for more information. Dana Point, CA – (December 7, 2004) – Is bigger always better? In the case of many Nordhavn owners, it is. Since the first Nordhavn was built nearly two decades ago, we’ve seen countless Nordhavn owners move up to bigger Nordhavns. 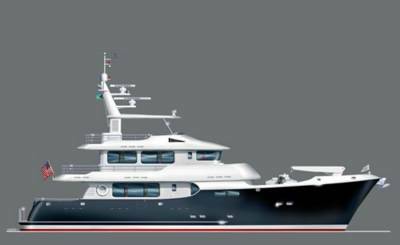 So it’s no surprise that Pacific Asian Enterprises, Inc. (PAE) is announcing a brand new larger model: the Nordhavn 86. Heeding current Nordhavn customers’ requests as well as a heavy market demand for a larger boat, the design team put together lines for a gorgeous yacht that will take over as Nordhavn’s new flagship in 2006. But timing is crucial. And the fact that the Nordhavn 86 is being introduced now is no coincidence. Yes, it is a logical progression from the 72/76 model. But producing these complex, large-scale boats is a challenging endeavor – one that PAE heads feel their partner factory in the Far East, as well as their own skilled project management, engineering and design teams, are ready for. As with all Nordhavns, this new 86-foot passagemaker will be built from a complete set of precision, high-polished female molds. The deck structure will be a single seamless molding for maximum strength and will possess surfaces of gleaming, low maintenance gel coat that will reflect an exceptional finish. Tooling is scheduled to commence next month with the first boat completing toward the end of 2006. PAE intends to package the base boat with extensive equipment and systems as standard, and is aiming for a selling price of around $5 million. And with the first three hulls already having been reserved, it should prove to be a popular-selling vessel like all the Nordhavns before it. Actually, we saw a few of these fine yachts when we were down in Vista, at my sister's house. My nephew is a project manager for PAE and so we got a tour of two of them; a 57' and a 62' model. So take a look at the website for Nordhavn...pick out the model you want and just mention my name when you order it...Thanks! I will send up an image of the new 86' in just a second or two. 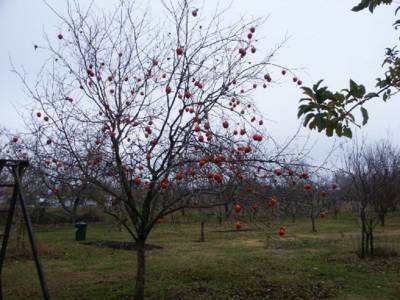 As you can see from the "sad" picture of the persimmon tree, it's winter here. And this is the time of year when the persimmon tree loses all of its leaves and displays the bright orange fruit in all of its glory. Yes, winter is here, but when I awoke, the house was nice and warm, and the fire was still going. I just added a log and kept the stove at the same low heat setting. I can keep this up all day! I have plenty of firewood for this winter and I understand that there is always a good supply of wood available from the orchards. But why am I exulting? I made a vow when I left Janesville that I would never, ever have to deal with firewood again! Well, so much for some vows and my ability to keep them. But…in my defense, I have to say that we used up to 7 cords of wood each year while we were in Janesville and the fire was lit in September and didn’t go out till May or June of the next year. That fire needed to be fed 24/7 and I was the one that had to cut and split it all. I finally started buying logs by the truckload and they would be delivered by a logging truck, right to my yard. Then I could cut and split as I needed and not have to spend every weekend up in the woods, looking for firewood. Even that convenience didn’t make the use of firewood seem any more attractive. I longed for a thermostat on my wall and a furnace to roar to life whenever it was needed. Well, now I have that furnace and our monthly bill for natural gas went up to $125 from a summertime low of $10. So here I am, once again, throwing another log on the fire. Many years ago...when I was in the Navy, these quick loan shops operated much as they do today. If anything has changed at all, it's the fact that the loan shops are now closer to the front gate of the bases. Today, this situation makes a good news story. But when we are at peace, this story will go back to being non-news and military personnel will go back to being the second class citizens that most Americans think they are. Some things never change. More from Mencken...some good, some bad...but all thought provoking.